Sweet potatoes are colorful and nutritious crowd-pleasers. The subtle heat and bright flavor of the lime plays beautifully against the sweetness of the potato. Place the sweet potato in a wide saute pan with 1/2 cup water. Cover and bring to a boil over medium-high heat. Cook for 3 minutes, uncover, and let liquid burn completely off. Scoot sweet potato to one side of the pan and add the oil. Let the oil heat up and then spread the sweet potato back out and toss to coat with oil. Add shallot and sea salt and toss to mix, then let sit so things can caramelize. Cook for 5-7 minutes, tossing just a few times, until sweet potato is tender and both sweet potato and shallots are golden brown in places. 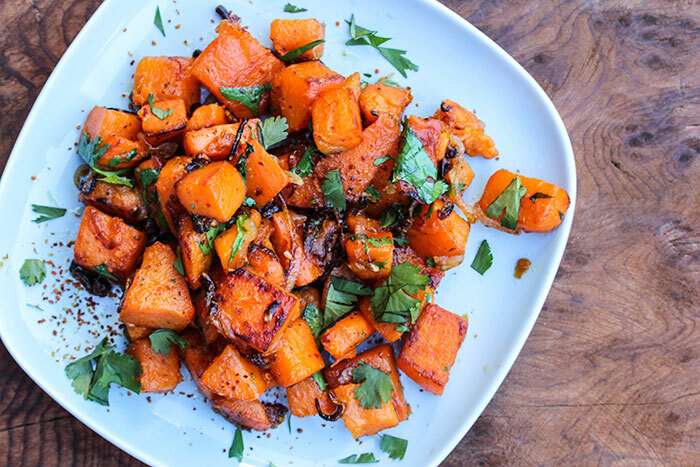 Toss sweet potatoes with cilantro and slide onto a plate. Squeeze lime juice into pan and scrape up any brown bits stuck to the bottom of the pan. Let cook for a minute or so until juice thickens slightly, then pour over sweet potatoes and give them a gentle toss. Sprinkle chile powder on top and season to taste with additional salt.